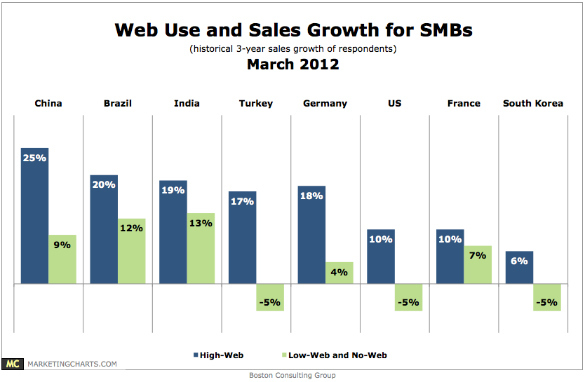 Anyhoo, this comes from a recent Boston Consulting Group study that covered a wide range of web-related topics — one of which is the effect that web use has on small business sales growth. In a nutshell, the study confirms what you surely would’ve assumed to be true: The more active a small business is in using the web to market itself, sell products, and support its customers … the higher growth that business will experience. Like I said, there’s a “no duh” aspect to this, but still good to see some data supporting the value of having more than a minimal web presence. This is actually good to have to convince clients who are new to the web. Yes, believe it! I’m meeting with one on Wednesday who has no web anything and I can say simply ‘you’ll’ make more money instead of steadily losing money’ if you do Internet marketing. Much better than talking about a lot of things he would not understand. This is a 60+ business owner who has done fine until the recent economic downturn on more or less no marketing (standard YP ad and word of mouth). Hope it helps, then, Kris – thanks. Your comment is a good reminder that there still are some folks out there who are unconvinced of the need/benefits of being online. Matt, you cannot believe how many small local businesses who are still not convinced about the benefit of a web presence. The closest many come is a facebook page, or I should say a facebook profile. Yes, I see many businesses setting up profiles instead of pages, ugh. Your sharing these types of studies helps provide myself and others with the stats which will hopefully convince more businesses to get online. Hi Matt, I’m currently researching for a post along these lines. It is indeed a no-brainer but that is exactly what we all too often come up against…..no-brain business owners. That’s harsh I know, but it really amazes me how many business owners I talk to that are quite happy with the website their nephew stuck together in MS Expression Web back in ’03. These stats are exactly what we need!